One of the best things in the world is a getaway from the cold weather when your family and friends are socked in with snow. Seeing pictures and posts on Facebook of your neighbor snow blowing his driveway because 2 feet of snow fell the night before while you are enjoying a Corona on the beach of a fantastic resort on the Sea of Cortez allows us as humans to laugh at each other just a little bit. What better situation is there than inviting your closest family and friends to Cabo San Lucas for your destination and having beautiful wedding photography to prove it. This couple came down south for a wedding photo shoot on the shores of the sea. We found this lovely little spot called the East Cape and we went on a day when the waves were crashing beautifully against the rocks. Though we did get a little bit wet we were able to get some epic Couplescape images while the water was in full white. 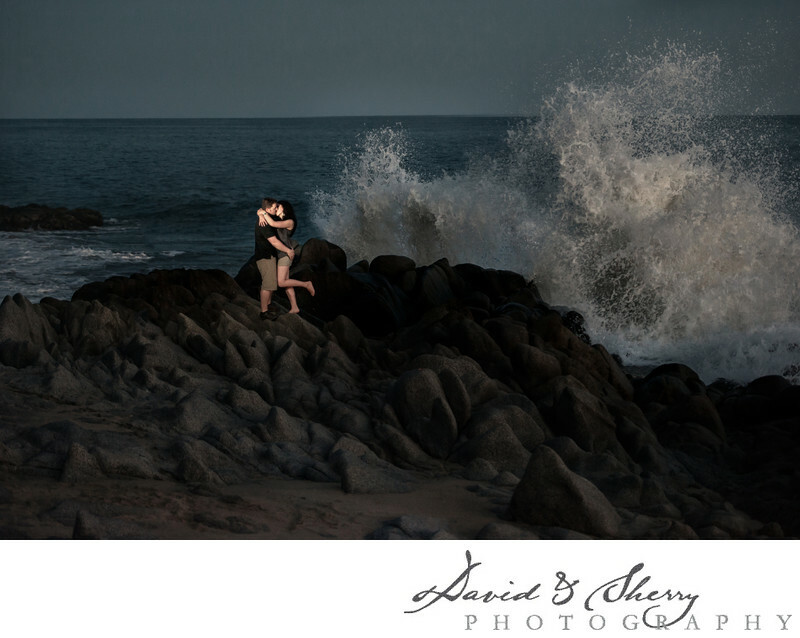 We shot this photo at dusk using a flash to add accent to the couple against the rough water. We love Cabo weddings and can't wait until our next one. Cabo San Lucas is located on the Baja in Mexico.